Whether still trapped in the mesh of a net, on a market stall or on your plate with rice and an onion sauce, fish are everywhere to be seen in Senegal's peninsula capital, Dakar. "Families have lived off fish for generations," says Issa Fall, who co-ordinates the Fisherman Committee at the small bay of Soumbedioune on the coastal road that leads to the city centre. The bay forms a large curve with one of Dakar's main fish markets on its shore. A dug-out canoe carrying a handful of fishermen slows down on the last wave before it reaches the sand. It is coming back with the day's catch. Dozens of similar boats or "pirogues" are lying on their flanks while a couple of others are being sculpted a few metres away. They are hand-built from local timber. Illegal fishing is a sensitive subject, which sparks anger and bitterness here. "Fish stocks have been reduced, it's become scarce," Mr Fall says. "For this market alone, we used to offload 3,500 tonnes each year; we can't even do 3,000 tonnes now." The ocean off West African coasts is home to one of the world's richest fishing grounds. From Morocco up north down to Guinea, sardines, grouper, snapper, shrimp and mackerel are part of a rich marine fauna exploited by fishing vessels on an industrial scale. "These underwater grounds are now at risk of collapse," warns the Senegalese Fisheries Minister, Haidar El-Ali. A famous former environmentalist and campaigner, Mr El-Ali is currently handling a near diplomatic incident with Russia after the Oleg Naydenov trawler was seized by the Senegalese navy for allegedly fishing with no licence in the country's waters. In a statement posted on its website on Wednesday, the Russian Foreign Ministry said that Russian diplomats in Dakar were collaborating with the local authorities to obtain the vessel's release. The Russian vessel's owners face a $800,000 (£486,000) fine - double the usual fee because the Oleg Naydenov is a "repeat offender", having been caught once before in the last two years. But in an incredibly valuable industry, fines are no deterrent; foreign vessels always come back and can easily cover or change their identification markings. "Fines represent only a fraction in their operational costs," says Steve Trent, executive director at the UK-based campaign group Environmental Justice Foundation (EJF). EJF researchers estimate that West African waters have the highest levels of illegal catch in the world, at about 37% of the region's total. If West Africa stands out, it is part of a global problem putting a strain on the planet's fish stocks. Up to 26 million tonnes of fish, worth more than $23bn, are estimated to be lost annually to what is officially called "Illegal, Unreported and Unregulated" (IUU) - or pirate fishing. In Sierra Leone alone, one of the world's poorest countries still recovering from civil war, the EJF estimates losses at $29m each year. Mr El-Ali wants a tougher law. "Vessels we caught pay a fine and go, but they do it again," he says. "We must be able to keep them when we seize them, so there's a real punishment." As the world's largest fish importer, the European Union holds a massive responsibility. Maria Damanaki, the EU commissioner for Maritime Affairs and Fisheries, has recently blacklisted Guinea, Cambodia and Belize. These three countries, some of the most valuable sources of seafood, are now banned from exporting fish to the EU for failing to act on pirate fishing. South Korea has been officially warned it may soon end up on that list. Vessels registered there have been illegally operating off the coasts of West Africa repeatedly. "There is a problem, it would be very irresponsible to say that there isn't," Oliver Drewes, the EU fisheries spokesman, said. "We're doing our best to control our boats, we are making progress but there's still a long way to go." An EU diplomat, who refused to be named, insisted that "the issue of control in West Africa is huge". "But these states also have to take deterrent measures and clamp down on corruption." A source at the Senegalese fisheries ministry admitted that vessels' crews often pay bribes to get away as soon as they are caught in national waters. The EU has also come under fire for fisheries agreements that it has signed with North and West African countries. Campaigners often argue that EU countries are doing elsewhere what they have done at home, depleting seas of fish stocks at the expense of local communities. Mr Drewes acknowledges the need for more "open and transparent agreements, under fair economical and environmental conditions". A bilateral agreement with Morocco - one the most controversial deals - was revised last month. Concerns have also been raised that the agreements are only benefiting the European fisheries industry without helping local fishermen. "Agreements must take into account that it is some of the poorest countries' resources after all," says Mr Trent. "They must provide employment, food security and income for the generations to come." 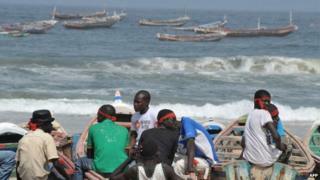 In Senegal, more and more unemployed youth jump on boats to make a bit of money. While fishing used to be a family business, these newcomers do not hesitate to join illegal operations. "Not only we have to face non-authorised foreign vessels but we also have to check our own artisanal fishermen," says Cheickh Sarr, head of the national Protection and Surveillance of Fisheries Agency. "Artisanal practices can also violate the law while others work with illegal foreign crews for better money," he says. He explains that it was a French plane assisting the Senegalese navy which spotted the Russian trawler a few days ago. "We lack the resources to patrol everywhere," he says. The Oleg Naydenov was reportedly caught with 1,000 tonnes of fish on board - an amount local fishermen are unable to scoop up in such a short time. On the shore of the Soumbedioune bay, Mr Fall points at the ocean and says he fears it is becoming "empty." "We are forced to go further out, which means spending more on fuel," he says. "Our revenues have come down. We used to be able to save a bit for our children's education or to fix our boats but it's now become hard to make ends meet."